Showing 19 articles from August 16, 2016. Ducks Unlimited gave a presentation at the Grays Harbor County commissioner's meeting, held Monday, August 8. The presentation was given in hopes of gaining the county's support. The company that is selling the property, Anderson and Middleton, is interested in selling the property, but is hoping to sell the property to an organization that will still focus on conservation and public access. Photo by John Larson -The Enchanted Valley Chalet taken on June 14, 2016. If you've seen it for yourself, you'll agree that the Enchanted Valley Chalet is a magnificent structure sited in a valley so grand that Yosemite should be envious. The valley, now a designated wilderness area, is undeniably rich with human history and the crown in that story is the chalet. This grand old building is one of our Olympic National Park's last, and finest, remaining structures dating to the days before the "park" was officially a National Park. On Wednesday August 10 around 2:55 pm the Washington State Patrol responded to an accident 1/2 mile north of Ocean Shores. The WSP report states that drugs or alcohol was involved in the collision. The site where the homeless encampment that popped up in June has caused a bit of a stir in the Hoquiam community, at the Our Lady of Good Help Church. A fresh face is in Ocean Shores. Julia's Psychic Boutique has opened at 877 Point Brown Ave NE. Psychic Julia opened her doors a month ago after renovating her space to the warm and calming environment it is. She commutes from Puyallup on the weekend, so for now the shop is open Friday - Sunday 10am-9pm. You can also pick up gifts, incense, candles, smudge sticks, and Psychic Julia's very own chakra jars at her shop. In honor of the National Park Service Centennial, the Washington State Parks and Recreation Commission is offering free entrance to state parks on Thursday, Aug. 25--the 100th anniversary of the federal agency. Day-use visitors will not need a Discover Pass to visit state parks. On Saturday, August 6 the Washington State Patrol deployed spike strips on U.S. Highway 12 between the off ramps in Montesano. 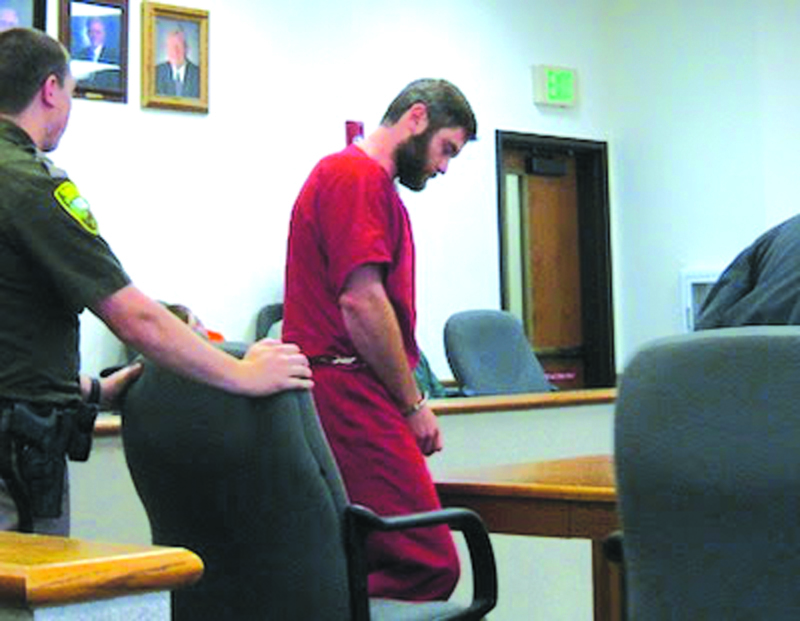 Photo courtesy of Washington State Patrol - Robert Hicks walks into court in handcuffs. The man arrested last Wednesday for hit and run in connection with a head-on crash in Winlock leaving another driver seriously injured allegedly showed up at a Winlock woman's home that morning looking a little beat up with blood on him, asking for a ride to Kent. A 28-year-old Centralia man was booked into the Lewis County Jail Saturday night after he apparently stole a Humvee from the Centralia Police Department. 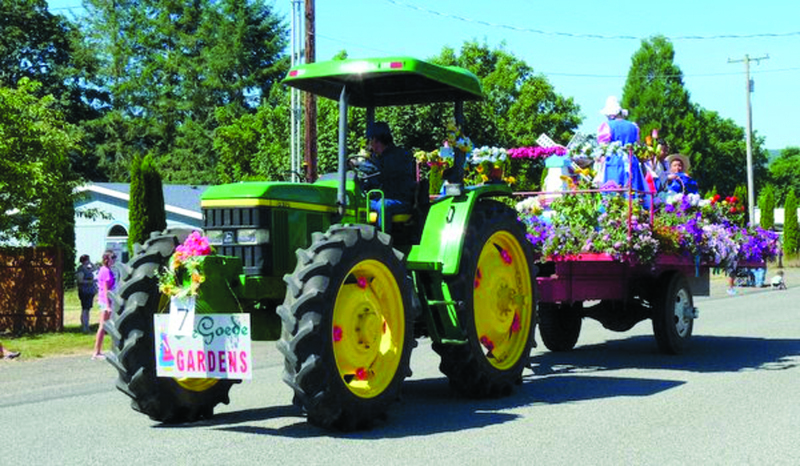 Photo courtesy of Mossyrock Lions One of the most colorful floats each year, the DeGoede\'s Gardens float, makes its way down the Mossyrock Blueberry parade route. Brian Kitts, 43, is now on trial for the 2000 murder of Sharon Cox. Beginning August 16th, prosecutors will try for a third time in 16 years to convict someone for Sharon Cox's murder. Washington youth soccer passed new requirements for field and goal sizes state wide. This required the Winlock Soccer Club to purchase new goals for U12 and U14 teams. For the 2016 fall season they are in need of purchasing the U14 goals for the start of games in September. 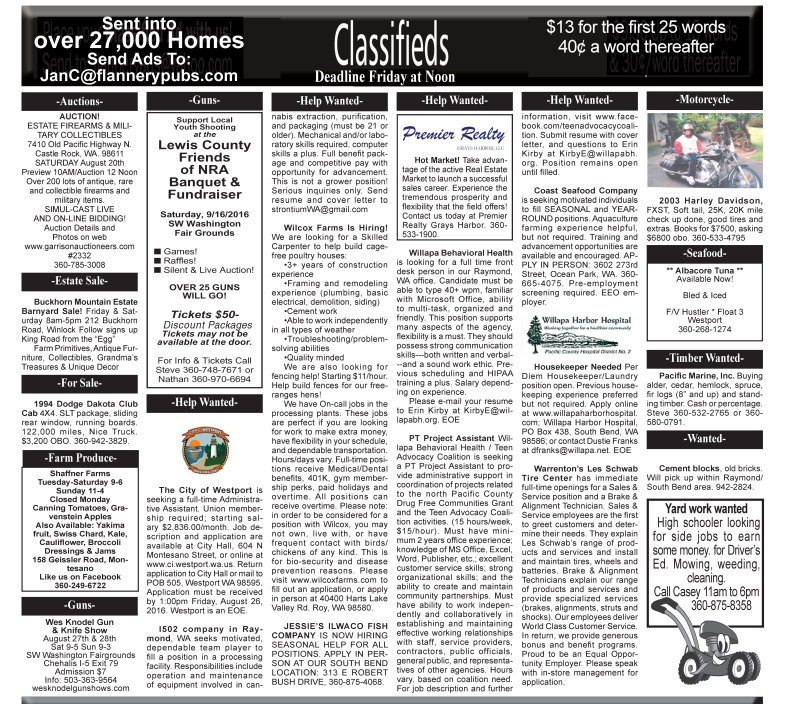 The Raymond City Council met on Monday, August 15 for the bi-monthly council meeting. The meeting was started with the pledge of allegiance, before the council moved to approve the current agenda as well as the minutes from the previous meeting. All members of the council were present, with one council seat vacant at the moment. 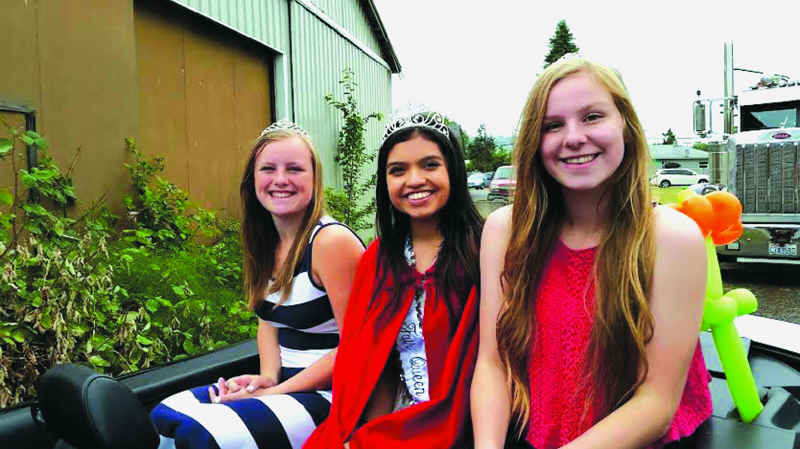 Photo Courtesy Marcy Olsen Walden - The 2016 Pacific County Fair Court includes from left Traci Hoffman, 2015 Queen Sandra Sanchez and Makenna Williams. The Pacific County Fair is pleased to announce the 2016 Pacific County Fair Court. 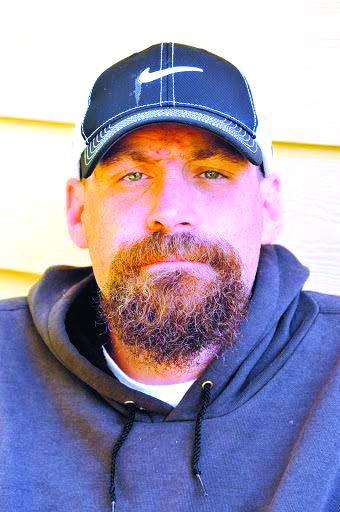 Cory D. Johnson, 46, of Long Beach entered guilty pleas to third degree assault and three counts of felony harassment in Pacific County Superior Court Friday afternoon. 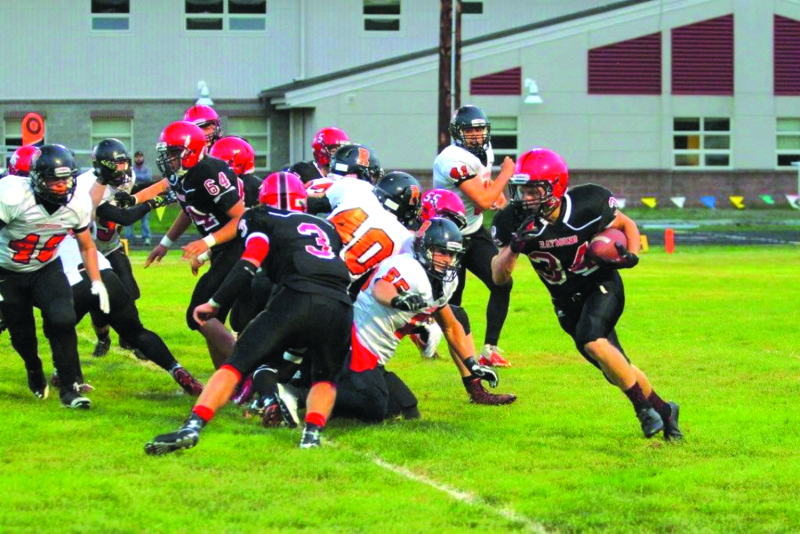 Photo by Larry Bale - Raymond takes on the mighty Napavine Tigers in its season opener September 3. The Tigers finished second in last year's state playoffs. Luke Abbott is the head coach for the Seagulls. Raymond's football season starts with a tough contest on the road versus State runner-up Napavine on September 3 at 7 pm. SOUTH BEND - Baseball and fastpitch softball fans have "gotta love it." By a 4-to-1 vote, the South Bend School Board of Directors voted to implement baseball and fastpitch softball on the varsity level effective for the Spring 2017 seasons. The action took place at last Wednesday night's board meeting in South Bend. The Washington Department of Fish and Wildlife held a meeting at the chamber in South Bend on Thursday, August 11, to present their 2016 Washington's Wild Future plan. Earlier in 2015, the WDFW asked people throughout Washington to share their thoughts on what the department is doing right, and where it can improve. Throughout the survey many citizens responded bringing up such issues as fishing regulations to the desire for more recreational and commercial fishing opportunities.